Super Smash Bros. Brawl is a fighting game for the Wii. This is the third installment in the Super Smash Bros. series and the follow-up to Super Smash Bros. Melee for the Nintendo GameCube. It was designed by Masahiro Sakurai, who also made the preceding Super Smash Bros. games, and developed by a team that was specifically created for it. The game uses a game engine called Havok that mainly focuses on the game physics, which was provided by an Irish company of the same name. After a planned release date of December 3, 2007 in North America, all regions had their release dates pushed back. It was then slated for release on February 10, 2008 in North America, and January 24, 2008 for Japan. However, on January 15, 2008, it was then delayed to January 31, 2008 for Japan and March 9, 2008 for North America. It was released in Oceania on June 26, 2008 and in Europe on June 27, 2008. The Nintendo Wi-Fi Connection has been shut down as of May 20, 2014, making it no longer possible to play this game online. Super Smash Bros. Brawl shares the same basic controls as its predecessors. Players attack their opponent to increase the opponent's percentage. The higher the percentage, the faster players will be sent flying. The objective is to knock opponents off the blast line to score a KO. Again, this game employs simple button inputs to perform various moves. performs basic moves on the ground or in midair while has the character perform special moves. Players can do several moves depending on where is tilted. If players are knocked from the stage, they can use their midair jump and special moves, typically and tilting up on to recover. Another basic, yet vital move players can do is to shield, which blocks most attacks. The shield shrinks the longer the player holds the button or if the shield blocks attacks. If the shield is too small, the player is vulnerable to attacks, the process of which is known as shield stabbing. If the shield breaks, the player is momentarily stunned. Grabs can also circumvent the shield. Once the player has grabbed an opponent, she can either pummel the opponent with the attack button or throw the opponent with . Opponents can break free of grabs by moving the control stick and mashing buttons, but the higher the percentage, the longer it takes for opponents to be released. A new battle mechanic is the Final Smash that was originally intended to be featured in the first game of the series, but was scrapped for technical reasons, which can be used only by collecting a Smash Ball. Players are now able to walk and jump while using projectile-shooting items, like the Super Scope, where in Melee, this wasn't possible. As a new feature in the game, certain characters can crawl. Such characters are Bowser, Diddy Kong, Ivysaur, Lucario, Luigi, Pikachu, Sheik, Solid Snake, Squirtle, Wario, Yoshi, and Zero Suit Samus. A new technique called the Footstool Jump is introduced. It allows players to jump on an another player's head up to five times and spring up by pressing the jump button at the right time. Players are be able to perform Meteor Smashes by doing this as well. The tether recovery is a returning tactic in the game. It allows players to grab onto ledges using chain-like items, such as a Plasma Whip or a Link's Hookshot. Gliding is also a technique in this game, available only to winged characters. When gliding is used, players are able to glide across the stage and be able to control the way they fly. They can direct themselves upwards or downwards, depending on the direction the or the is pointed in. Another feature not present in the past two games is slipping. Any character can slip. The feature has no upside for the players that slip other than the invincibility frames that are granted to them when they get up. Players can slip when trying to run suddenly, go down slopes, turn around or walking on a Banana Peel. The game also features three different Taunts for each character, while the past games only feature one taunt. Snake is the only character that has all identical taunts. There are a few differences between the controller methods. 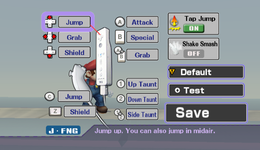 The Wii Remote and the Nunchuk Attachment has a special feature, the Shake Smash, allowing the players to execute smash attacks in the direction they shake the controller to. The Classic Controller, Wii Remote + Nunchuk Attachment, and the GameCube controller also have a function which disables the jump by tapping the control stick upwards. The execution of standard combos has been made simpler; for many characters, the attack button no longer has to be hit repeatedly, but it is enough to hold it down for the character to start a combo attack. The effects, however, usually differ. 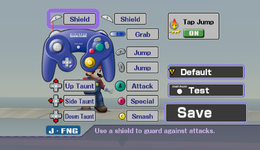 Players are able to set their own button configuration rather than have to play with the default configuration. The configuration can be saved on the Wii Remote's internal memory, allowing to take it to a friend's and play with one's own button configuration there. The Players are able to insert names with up to five letters, as in Super Smash Bros. Melee. In the previous game, names are only a gimmick. In this game, they now also save the players' controlling options to avoid having to select the control method each time. The character select screen, with all characters unlocked. The entire cast, as they appear in the opening. With 35 playable characters (39, if Sheik, Zero Suit Samus, and the Pokémon Trainer's three Pokémon without including Pokémon Trainer are counted), Super Smash Bros. Brawl has 10 more characters than the previous installment. 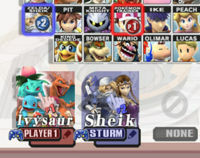 21 characters (25, if Sheik, Zero Suit Samus, and the Pokémon Trainer's three Pokémon without including Pokémon Trainer are counted) are available directly from the start, while the other 14 need to be unlocked to become playable. Only five of the characters from the previous game aren't playable in this game, which are Roy, Dr. Mario, Young Link, Pichu, and Mewtwo, while 15 brand new characters (18 counting Zero Suit Samus and only the individual Pokémon) have been added. Additionally, Super Smash Bros. Brawl is the first game in the series to feature third-party characters as playable characters, in this case being Sonic and Solid Snake. The Special Moves and Final Smash for each character are listed on the right-side column. Of the roster, eight characters are from the Mario universe and its sub-universes: Mario, Luigi, Princess Peach, Bowser, Donkey Kong, Diddy Kong, Yoshi and Wario. Mario is the most balanced character in the game. He has medium weight, speed, and strong attacks. Unlike Luigi, he can wall jump. As a balanced character, he is armed with a projectile, a fireball, a cape that reflects opposing projectiles and flips opponents, and even a meteor smash. His F.L.U.D.D., which can be charged up and aimed, pushes opponents and items away (it replaces his Mario Tornado, although he uses the Mario Tornado for his down aerial attack) while his Super Jump Punch provides a small midair jump, mainly for recovery. For his Final Smash, Mario blasts a giant fireball that moves slowly and horizontally. Opponents that are trapped in this fire ball may be damaged and even pushed to get KO'd. Link has moderate strength and uses numerous types of weapons while fighting, such as bombs and boomerangs. His bombs affect both himself, teammates, and opponents. His boomerang not only damages and pushes foes, but can also move items. His bow, which can be charged, is another projectile. His spin attack, which can be charged if Link is on the ground, provides an additional jump necessary for recovery. Link also uses a Claw Shot for his grab, giving him extended reach, and he can use it even to grab ledges. Link also has a functional shield that can block projectiles. If Link initiates his Final Smash close enough to an opponent, he slashes the opponent several times before a final hit that knocks away the opponent. Kirby is one of the lightest characters in the game. Added with that is his many jumps, making recovery for him easier than most characters. Since he is light, however, he can be knocked away easily. Kirby can copy his opponents' standard special move with Inhale or spit them out. His Hammer, a strong move, behaves differently depending if Kirby is mid air or on the ground. Kirby's Stone slams on opponents from above while giving Kirby temporary protection from most attacks. Finally, his Final Cutter sends him up while he slashes down. Not only this is a recovery move, but if Kirby lands, it can create a fast shockwave that is a projectile. Once Kirby uses his Final Smash, any nearby opponents may be drawn inside Kirby's pot, take some damage, and be knocked out. Fox McCloud is a very fast character in regards to both attack speed and running speed, though he has average strength. He has high falling speed, although he is slightly lighter than average. Fox's Blaster is a quick laser that inflicts damage, but no flinching. The Fox Illusion, which strikes horizontally, can surprise opponents. His Reflector reflects most projectiles, and if it is used close enough to opponents, it knocks them away. His Fire Fox, an additional jump, can be aimed at any direction. Fox enters his Landmaster when he uses his Final Smash. The Landmaster can move, flip, shoot, and fly, all that can damage and K.O. opponents. Pikachu is one of the lighter characters. It can be knocked away, and has weak attacks, but it is also one of the faster characters in the game. It has Thunder Jolt as a projectile that moves along the surface of the stage. Pikachu's Skull Bash can be charged to ram into opponents or be used as another jump. Its Thunder attacks opponents directly above it. Its Up Special, Quick Attack, is a quick, two-jump move used for recovery. The Pikachu in Brawl is implied to be male, as it lacks the heart-shaped indent in its tail that female Pikachu have. Pikachu's Final Smash, Volt Tackle, is fast and powerful, but difficult to control. Diddy Kong is mobile, light, and has a variety of attacks, such as the Peanut Popgun from Donkey Kong 64. He can use the Monkey Flip to latch on opponents, an attack, or as another jump. Diddy Kong can also spawn a banana peel, which can be used as any other item. Diddy Kong's Rocketbarrel Boost is another jump, but can be charged to provide additional height. When Diddy Kong uses his Final Smash, he rides in his Rocketbarrel and shoots peanuts rapidly. He is a small heavyweight with great aerial game and recovery, but he has poor range and somewhat slow attacks. Both his outfits from the WarioWare series and the standard Mario and Wario Land series are available, each with their own set of colors. Though he is a heavyweight, he has average strength. His Chomp snares any opponent into his mouth. His Wario Waft, depending on when the last time it is used, can be a potent attack and even an additional jump. Wario can also use his Wario Bike to ram into opponents or as an additional jump, but he cannot have more than one bike at a time. Wario-Man, Wario's Final Smash, is essentially an upgraded form of Wario. Wario-Man has greater movement and much stronger attacks. Lucas has a special moveset similar to that of Ness, and a unique normal moveset. For instance, his up smash is slow, but powerful. Lucas uses PK Freeze, which moves quickly, to freeze opponents temporarily. His PK Fire explodes on contact. Lucas's PSI Magnet, which Lucas deploys in front of him, absorbs projectiles and heal him. Lucas's PK Thunder is an electric projectile that can be controlled, and if it touches Lucas, Lucas is propelled for some distance. This can be used as another jump. When Lucas uses his PK Starstorm, several fireballs rain in a fan formation, hurting players that touch them. In addition to the characters listed above, the following characters can be unlocked when certain requirements are met. Additionally, as new characters are unlocked, they are added to the group of fighters at the beginning intro of the game. Ness appears in Super Smash Bros. Brawl as an unlockable character. His moveset is similar to Lucas, but differs slightly. Despite being slightly light, he has adequate strength. Marth is a quick, but slightly weak, character, and relies on strategic offensive and defensive play. Like in Melee, his sword does more damage at the tip of the blade, but his grab range is much shorter. Luigi returns with a somewhat similar moveset to Mario. Luigi can jump higher than Mario, slightly faster, and his attack strength is unusually high. Falco Lombardi returns in Super Smash Bros. Brawl with a similar move set of Fox McCloud such as the Final Smash, but several differences. He has the highest initial jump of any character, and is very good at aerial combat. However, he is very light. Captain Falcon returns as the second fastest runner in the game. His attacks are strong in terms of knockback and damage, but they are also slow and short-ranged. Lucario has average speed and good range, but normally doesn't have much power. However, his power increases as he takes damage, maxing out at 170%. He uses his aura for most attacks. Solid Snake, one of two third-party characters, uses a variety of explosives and weapons in battle, as well as a rifle. He is a heavyweight character and has powerful attacks. R.O.B. is a heavyweight, and, despite being heavy, it is also rather weak and a bit fast. Ganondorf returns with extremely powerful, yet extremely slow attacks. He is also very heavy and large. However, his movement is very sluggish, making him one of the slowest characters. Mr. Game & Watch has a completely 2D physical appearance, with his moves being references to the Game & Watch titles. He has good offense, due to his fast and powerful attacks, but poor defense, due to his light weight. Sonic the Hedgehog, one of two third-party characters, is the fastest character in the game, outspeeding everyone else. He also has decent strength, and is a middle-weight. Play a combined total of ten hours of Brawl matches. Jigglypuff has the slowest falling speed, the second-fastest air speed, the slowest dash speed, and the lightest weight. Despite being light, it also has quite good strength. It has a moveset that is quite similar to Kirby's, with the exception of the special moves. Toon Link is almost exactly like Link, but is quicker and floatier. Wolf O'Donnell is one of the heavier characters, and he has both an average speed and an average attack power. However, due to their poor accuracy, Wolf's recovery moves are rather poor. There are 41 total stages in Super Smash Bros. Brawl. 10 of these stages are returning stages from Super Smash Bros. Melee. Super Smash Bros. Brawl: Battlefield Returning from Super Smash Bros. Melee, the stage is now set in a green landscape and features different times of day. A valley can be seen in the background of the stage. A basic stage, it contains no stage hazards. Super Smash Bros. Brawl: Final Destination A wide, flat stage, with no gimmicks. Master Hand and Crazy Hand are also fought at Final Destination. Super Mario Sunshine: Delfino Plaza A moving stage, comparable to Mute City from Super Smash Bros. Melee. It features a flying moving platform that takes the characters to various locations in Delfino Plaza. The platforms change according to where the moving stage lands. The stage has also water where fighters can float on. Mario Kart: Mario Circuit The stage takes place on a figure-8 circuit's intersection, with Shy Guys driving in from behind (hits the lower level) or the sides (hits the upper level). These Shy Guys can be KO'd temporarily if the player attacks at the right time. Donkey Kong Jungle Beat: Rumble Falls A Donkey Kong stage similar to Icicle Mountain. It has numerous obstacles, switches and ladders on the way up. It scrolls automatically up. Some obstacles include thorns that inflict high knockback. Occasionally, the stage can also speed up, making it more difficult for fighters to keep up. The stage eventually loops to the beginning. The Legend of Zelda: Twilight Princess: Bridge of Eldin A flat stage with walk-off blast lines. King Bulblin and Lord Bullbo, occasionally destroy the bridge, forcing the battle to not be fought in the middle of the stage. Several Bulbins, which can be defeated, accompany King Bulbin and Lord Bullbo. After some time, however, a portal restores the bridge to normal. Metroid: Norfair A stage that takes place inside Planet Zebes, similar to Brinstar Depths from Super Smash Bros. Melee. Lava occasionally rises from the bottom of the stage, but lava falls can creep into the sides of stage. Lava spurts can also affect some parts of the stage. When a giant lava wave approaches the stage, players must enter a capsule or be high enough to dodge it. Metroid Prime: Frigate Orpheon From the game, Metroid Prime, Frigate Orpheon occasionally flips around, switching between two groups of platforms to fight on. There are temporary, moving platforms on the sides of the stage that can assist the player. Occasionally, the stage has a power shortage, making it dark, but this is purely aesthetics. Yoshi's Island: Yoshi's Island Yoshi's Island is based on its appearance in Yoshi's Island DS. It changes seasons as the fight progresses. Several Fly Guys, which can be knocked away, hold items that can help the player. A Blarggwich appears occasionally to assist knocked-off players. Meta Knight's ship. Takes place on a Battlefield-like platform, then lands on the Halberd itself. On the Halberd, a laser cannon can target one player and then shoot. A giant arm can also attempt to attack one player; it warns of its attack by swinging several times. Then, the main platform rises and leaves the Halberd, restarting the loop. Star Fox: Lylat Cruise A stage that moves through the Lylat System. Very similar to Corneria and Venom. The stage goes through various settings, including a laser battle, although the stage has no gimmicks that can affect gameplay directly. An exact copy of the Pokémon Stadium from Super Smash Bros. Melee (which has fall through platforms). This stage is now upgraded to look like Pokémon Stadium 2, the game. It changes temporarily into one of four terrains as time passes: Ice, Electric, Ground, and Flying. Ice makes the ground slippery, electric has conveyor belts, ground is basic, while flying makes players floaty. All terrains have different layout. F-Zero: Port Town Aero Dive Similar to Mute City from Super Smash Bros. Melee, the stage takes place on a group of platforms that hover along a race track, stopping on occasion. Fast-moving F-Zero racers may enter into the scene, depending on where the platform has landed, and plow into characters for high knockback. Unlike in Mute City, these racers cannot be destroyed. Fire Emblem: Castle Siege Taking place on an unidentified castle, the stage changes layout eventually. The stage goes through three different layouts before restarting. In the second layout, there are destructible statues that hold platforms. Otherwise, the stage has no hazards. WarioWare: WarioWare, Inc. The players are sent through random Microgames. If players complete a certain task (such as hitting all party poppers), they are rewarded with invincibility, health regeneration, or a Super Mushroom effect. There is no penalty for failing. Players start on a simplistic stage, with a few platforms, although the platforms disappear. All stage hazards are found in the Microgames. Pikmin: Distant Planet A stage set on branches and vines, the stage is mostly neutral. A Bulborb can enter and leave in the right part of the stage, serving as a platform. It can, however, open its mouth and KO any fighter that comes close. Rain can also fall, making the left slope slippery and hardly useable. Finally, red, yellow, and blue Pellet Posies grow in the stage. Attacking these flowers release Pellets, making them able to be picked up and thrown. Throwing these pellets at a corresponding Onion can make the Onion release items, depending on the number shown on the pellet. Animal Crossing: Wild World: Smashville This is a mostly neutral stage with a low moving platform on the top. Balloons appear occasionally holding food that can heal the player. The stage's date time is based on the Wii's internal clock. K.K. Slider makes live performances Saturdays on 8 P.M.
EarthBound: New Pork City A stage comparable to and based roughly on Temple from Super Smash Bros. Melee, New Pork City is a very large and spacy stage, with mostly stationary platforms. One platform swings while the other, a hovering car, moves throughout the stage. The Ultimate Chimera may appear and inflict extremely high knockback on players it damages. Ice Climber: Summit A stage that takes place on a glacier. Initially, the only hazard is a single falling icicle on the bottom. Platforms can also collapse or realign themselves. Once the glacier detaches, however, characters become floaty. Once the glacier stops on the water, the water levels rise. A fish, meanwhile, can eat fighters or damage them with its body. Eventually, the glacier rises and restarts the loop. Kid Icarus: Skyworld Skyworld consists of several breakable platforms overlapping cloud platforms. These breakable platforms serve merely as ceilings and impassable platforms. Once they are broken, players can jump through the cloud platforms. Occasionally, in the low part of the stage a small platform hovers, assisting any players. Nintendo DS: PictoChat Comparable to Flat Zone from Super Smash Bros. Melee; as it is done in a typical black and white setting. Several sketches can appear and disappear. These sketches can be platforms, hazards, ladders, or obstacles. Metal Gear Solid: Shadow Moses Island A stage that takes place just outside a helipad. The walls on the sides can be broken (they eventually respawn), and sometimes, near the end of a match, a Metal Gear will appear in the background. The Legend of Zelda: Hyrule Temple Return from Super Smash Bros. Melee, the Temple is same as it was in the previous game, with a cover of the old background music plus additional ones, including the original track. Super Mario World: Yoshi's Island A replica of the stage from Super Smash Bros. Melee. Stage gimmicks such as the Rotating Blocks are still present. EarthBound: Onett A replica of the stage from Super Smash Bros. Melee. Cars serve as stage hazards while the middle building has collapsible platforms. Star Fox: Corneria A replica of the stage from Super Smash Bros. Melee. The Arwings and Wolfens are stage hazards and platforms while the Great Fox's laser canons can damage characters. Super Mario 64: Rainbow Cruise A replica of the stage from Super Smash Bros. Melee. It is a scrolling stage, with carpets, falling blocks, and various other platforms. Metroid: Brinstar A replica of the stage from Super Smash Bros. Melee. Harmful lava rises in a set pattern while parts of the stage are breakable. In addition to the above stages, there are several stages that must be unlocked to play on. Luigi's Mansion: Luigi's Mansion A stage based on the game Luigi's Mansion. If players attack the four poles suspending the roof, the mansion will collapse. After a certain time, it will rebuild itself, however. This stage can be unlocked by playing 3 matches as Luigi. The Legend of Zelda: The Wind Waker: Pirate Ship A ship on the ocean of The Legend of Zelda: The Wind Waker, Toon Link's Stage. Various events can occur. Cannons can fire at the ship, harming nearby fighters. The ships can also hit a rock and stop temporarily, having the rock serve as a platform. Finally, the ship can run into a whirlwind, sending it flying. The constant stage hazard is the ship itself; if the ship runs into a swimming player, the player may get K.O.'d. Also, a catapult-like lever on the ship can send players flying. Occasionally, King Red, a platform, follows the ship. The stage is unlocked once Toon Link has been unlocked. Pokémon: Spear Pillar The stage takes place at the top of Spear Pillar, located on Mt. Coronet in Pokémon Diamond and Pearl. Palkia can also reverse the screen and tilt the screen upside-down. Dialga appears as well, changing the speed of each fight or entering the fight and damaging nearby fighters with its body. Both Palkia and Dialga can create damaging beams and remove certain parts of the stage. Cresselia, when it appears, hurls a spinning light beam, damaging any fighters. It is unlocked by beating event #25. A stage based on the third stage of Donkey Kong. Constant stage hazards are the fire, and ladders can be climbed. An audio cue alerts when Donkey Kong will be active. Once he is active, Donkey Kong himself can harm players while he can send bouncing springs to harm the player. Objects can be collected for points, although they serve no other purpose. This stage is unlocked by playing 20 VS. Matches as Donkey Kong. Mario Bros.: Mario Bros. A stage resembling the Mario Bros. game. Shellcreepers and Sidesteppers appear as hazards in this stage. If they temporarily immobilized by attacks or when a fighter hits them by jumping underneath, they can be picked up and thrown as weapons. If the enemies are left immobilized for a while, they eventually get up and move faster than normal, changing colors. This stage is unlocked by beating Event Match #19. Game & Watch: Flat Zone 2 An enhanced version of Flat Zone, with references to Game & Watch games, which are Fire, Chef, Oil Panic and Lion. Each scene from Chef, Oil Panic, and Lion has its own stage hazards (such as the people from Oil Panic damaging fighters if they are attacked) and platforms while Fire has various objects including a figure that removes items and a trampoline. A figure with a bell signifies a change of scene. It is unlocked by unlocking Mr. Game and Watch. Electroplankton: Hanenbow A leafy stage, with water at the bottom. There are Hanenbows (species of Electroplankton) that fly around the stage and can knock players. Leaves, when they are attacked, tilt and change from green to red depending on how much they are attacked. The stage is unlocked after completing the event match #28, "Flowers Bloom in The Echoes". Sonic the Hedgehog: Green Hill Zone Inspired by Sonic the Hedgehog's first level, this course features a gentle, sloping dip. As the dip takes damage from fighter attacks, parts of it fall away, creating holes in the course until the stage regenerates. A checkpoint also spawns. If it is hit, it spins, hitting other players. The stage is automatically unlocked once Sonic himself is unlocked. Donkey Kong Country: Jungle Japes A replica of the stage from Super Smash Bros. Melee. Fast moving water and Klaptraps are stage hazards. The stage is unlocked by playing in Melee stages 10 times. Kirby's Dream Land: Green Greens A replica from Super Smash Bros. Melee. Whispy Woods blows in one direction, pushing fighters, while destructible blocks serve as platforms and obstacles. Bomb blocks can damage players and destroy items. The stage is unlocked by playing 20 matches as Kirby. F-Zero: Big Blue A replica of the stage from Super Smash Bros. Melee. The ground, to give the illusion that the platforms are fast-moving, can send players off-screen quickly. F-Zero racers, including the Falcon Flyer, and various floating platforms enter and exit the scene. It is unlocked by playing 10 matches as Captain Falcon. A replica of the stage from Super Smash Bros. Melee. As in Pokémon Stadium 2, the stage changes temporarily to four different layouts: Grass, Fire, Water, and Rock. It is unlocked by playing 10 matches on Pokémon Stadium 2. Items randomly appear on any stage in the game, and in standard Brawl mode, the player can choose to ban certain items from appearing or increase/decrease the frequency of items appearing. In Classic and All Star mode, these options cannot be modified. Certain items from particular game series appear more frequently than they would on other stages, such as Banana Peels on Donkey Kong stages, Poké Balls on Pokémon stages, etc. Assist Trophy Comparable to a Poké Ball, this summons a random character to help the character who used it. Banana Peel Can be dropped on the stage. If other characters touch it, the character will trip over it and fall. Barrel These bear a resemblance to crates but can tip over and roll. If hit by a rolling one, the player will receive damage. Beam Sword An item to be held, allowing the user to perform long-distance sideways attacks with the Sword. The more a smash attack is charged, the longer the beam of the sword extends. Bike Pieces If Wario's bike is dismantled, the pieces can be thrown at others. Blast Box If hit with a strong attack or fire-based attack, the Blast Box will explode, causing anything in the area to be blown away. Bob-omb A simple and powerful bomb. If it is left untouched for a little while, it will get up and walk around on its own. If one is thrown directly at an opponent, it explodes and causes a huge amount of knockback. Once enough time has passed in Sudden Death, Bob-ombs start to fall from the sky in droves. Bumper When thrown, it lies on the ground or floats in the air and hits back all characters touching it. Relatively powerful, and players can be K.O.'d. Bunny Hood The Bunny Hood provides a substantial boost to the user's running speed and jumping height. Capsule Break open these little capsules to find items. They are also effective as a throwing item. Capsules will explode on occasion. CD CDs add a single, random song to the player's collection when picked up. CDs will stop appearing once the player has unlocked every song in the game. Cracker Launcher Shoots out fireworks. Players can adjust the aim. Crate and Rolling Crate Attack or throw a crate to break it open and gain access to the items inside. There are three designs for crates. Additionally, some crates have dollies underneath them. Attacking these crates sends them rolling away. Deku Nut Throwing one of these near an enemy with creates a flash that stuns foes temporarily. When the Deku Nut makes contact with an opponent in midair, it can send them quite a distance. Dragoon When a player manages to collect all three parts of it, they can ram into the stage, knocking out all players within the crosshair. Fan This item doesn’t pack much of a punch but is easy to score rapid multiple combos; it can also be used to break shields. The Fan has deceptive strength when thrown straight up in the air in modes like Multi-Man Brawl. Fire Flower The Fire Flower is a shooting item that spouts a torrent of fire over a short distance, eventually running out of flames. Food Food items restore the consumer's damage. There are essentially 28 different types of food. Each item restores a different amount of health. Franklin Badge Deflects any energy-based projectile back at the opponent with double power. Freezie This icy item slides slowly along the ground. Throwing it at the enemy makes them freeze them in a block of ice, trapping them. Golden Hammer Acts like the Hammer, only is much stronger, and allows the player to float in mid-air, if the button is tapped rapidly. Sometimes, the Golden Hammer will be nothing but a Golden Squeaky Hammer, which cannot damage opponents. The Golden Squeaky Hammer is similar to the Hammer losing its head. Gooey Bomb Can be attached to the ground or a character and explodes after a few seconds. Green Shell Throw, hit, or jump on this shell to send it sliding along the ground. Green Shells can suddenly reverse the direction they are traveling if they bump into a wall or are hit by an attack, so keep an eye out for returning shells. Hammer Seizing this item makes the user unleash a barrage of hammer swings on a opponent. The attack itself is quite powerful but the user will lose the ability to perform midair jumps and special moves while attacking with it. Sometimes the head of the hammer will fall right off. Heart Container Picking up one of these reduce the damage by 100 percentage points. Heart Containers float slowly to the ground once they appear. Home-Run Bat Performing a Side Smash while holding this item to make a home-run-sized swing at the opponent that sends them soaring. It’s strong when thrown too. Hothead Hotheads slide across the ground releasing bursts of sparks and damaging the user opponents. When they are hit with fire or electricity-based attacks, they grow even bigger. Key This item will open locked doors the players encounter within The Subspace Emissary. If the player loses a key they were holding on the way to the door, they must return to where it was originally found. Lip's Stick Hitting an enemy with this or throwing it caused a flower to bloom on the opponent’s head. While the flower is on their head, the opponent will slowly accumulate damage. The more the user beats the foe with Lip’s Stick, the bigger the flower on their head will grow. The flower can be removed from the player's head by shaking the control stick back and forth. Lightning Touching one of these makes all of the user's opponents shrink. The effect is more dramatic and dangerous than the one brought on by a Poison Mushroom. Sometimes the Lightning will backfire and only the user will shrink. However it can rarely make people grow (bigger than a Super Mushroom's effects), therefore dealing an insane amount of damage and harder to knock opponents off the stage. Maxim Tomato These tomatoes are emblazoned with a striking letter "M." Eating one of these reduces the consumer's damage by 50 percentage points. Metal Box Turns the user into metal form, giving complete resistance to flinching from lighter attacks. The user falls faster after jumping. Motion-Sensor Bomb Set one of these on a floor or wall, and it will react to the next moving object in its proximity by detonating. They are small and inconspicuous, so they can catch opponents by surprise. Mr. Saturn A relatively weak item that can be thrown at opponents multiple times. Also a good shield breaker. Orange Cube This item gives valuable items and will not reappear once the player gets them. It also helps by increasing the clear percentage. They only appear in The Subspace Emissary. Party Ball When hit, Party Balls float up into the air and split open, raining down a torrent of items. These items are known to drop nothing but Bob-ombs on occasion. Pellet A throwing item found only on the Distant Planet stage. Throwing one at an Onion will release some items. Pitfall Can be set on the ground. Other characters fall straight into a pit when walking over it, or if hit directly with it. Poison Mushroom Touching one makes the consumer shrink in size; the user's blows will do less damage, and the user flies further when hit. Poké Ball Throw a Poké Ball to summon a randomly selected Pokémon that will assist the user. Power Suit Pieces After Samus sheds her armour during her Final Smash, Zero Laser, the pieces can picked up and thrown at opponents. Ray Gun The Ray Gun is a beam gun that lets the user fire fast-moving blasts. It comes loaded with 16 shots. When the user has exhausted the ammo, they can then throw the gun at the opponent. Sandbag Beating Sandbag up make it drop items and food. As Sandbag accumulates damage, it gradually becomes easier to hit far distances. Of course, beat Sandbag too much and its pool of items will run dry. Screw Attack While wearing it, the Screw Attack ability is added to the user's standard and midair jumps. The user is still able to attack as normal when capable of using the Screw Attack. Smash Ball Attacking one of these until it breaks gives the ability to use a Final Smash. Smoke Ball Emits a large cloud of colorful smoke. Doesn't do any damage, but sticks to anyone it hits. Smart Bomb A bomb that explodes with a large blast radius when thrown, destroying anything in its reach. May occasionally fail. Soccer Ball No one can pick up this item, but when a player hits the ball with a strong attack, it bursts into flames and flies off into the air, depending on how strong the attack is. The angle of the attack determines the direction the Soccer Ball will fly off in. Spring Hoping on a Spring makes the user perform an extra high jump. Every so often a Spring will topple over sideways. When it does so, anyone who makes contact with the fallen Spring will be knocked sideways. Stock Ball In The Subspace Emissary, Stock Balls increase the number of lives the player have left. Super Mushroom Touch one of these to grow huge. In this enhanced form, the user won’t fly as far when hit and is capable of dealing harder-hitting blows than usual. However, they become easier to strike. Super Scope This beam gun lets the user choose between attacking with rapid-fire or charged shots. The Super Scope holds enough energy for 48 rapid-fire shots, or about three fully charged blasts. Superspicy Curry Eat one of these and the player starts spewing flames from their mouth. The user can, however, continue to attack as normal. This item also has the side effect of making the user run, even if they try to walk. Starman Just touching one of these gives the user temporary invincibility. The effect lasts 10 seconds. Star Rod Perform a strong side attack or side smash attack while holding the Star Rod to swing the rod and simultaneously fire off a star-shaped projectile. When the user throw a Star Rod at the opponent, it sends them rocketing off sideways. Team Healer Only usable in Team battles, can recover a teammate's health if tossed at them. If thrown at opponents, it may hurt or heal them. Timer Picking up this item slows down the flow of time for all other players. Occasionally the Timer will have a different effect and only slow the user down, or it may slow down time for the entire stage and everyone. Trophy Stand This item turns enemies into trophies in The Subspace Emissary. Stronger enemies must be sufficiently weakened to be successfully turned into a trophy. Unira Throwing a Unira into the ground or attacking it causes its spikes to extend, damaging opponents who bump into it. Attacking the Unira again make its spikes retract. Vegetables Heals the player. Appears only on the Summit stage. Warp Star The user takes a ride on a Warp Star to launch a vicious attack from above on the opponent. It can be controlled where the Warp Star falls by using the Control Stick. 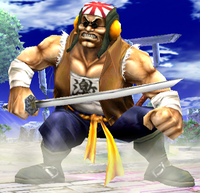 The Assist Trophy Samurai Goroh. The Poké Ball Pokémon Groudon. The Subspace Emissary is the equivalent to Adventure Mode of Super Smash Bros. Melee, but with a much more complex plot and more gameplay time. Subspace Emissary is set in the World of Trophies. There are five difficulties to choose from: Easy, Medium, Hard, Very Hard, and Intense. The player has a choice to save game progress after completing each level. The Subspace Emissary uses a team system. Two players can play in the Subspace Emissary at one time, with second player being an optional supporting character. Due to the camera following the main character, if the second character cannot follow the scroll and becomes off-screen, they are automatically warped. If Player 1 is defeated, and Player 2 is not, the game will still be over. Also, by pressing the Start or Plus Button, Player 2 can always warp to wherever Player 1 is. This, however, does not work during boss battles in the Emissary. The main screen shows where to go next, and the character selection screen allows the player to choose their team. In single player, teams are still available. However, the second character is akin to an extra life, and if the main character is defeated, the player takes control of the second character, until it, too, is defeated. The player is able to use Sticker power-ups for the mode. The stickers are arranging on the character's Trophy Stand and give bonuses on Launch Power, Launch Resistance, and powers and resistances to several attacks like Arm, Weapon, Slash, Electric and Flame. The effects vary from sticker to sticker. When the player loses all of their lives, they can be asked to continue but stickers and enemy turned trophies will be cut in half, if they decide to quit, they will get a Game Over and lose half of their stickers but they may keep the trophies. All unlockable characters can be unlocked by playing Subspace Emissary mode, but three of them can only be unlocked after the mode has been completed, and which then they must be beaten. The "Subspace Emissary" is the adventure and story mode of Super Smash Bros. Brawl, taking place in the World of Trophies, where being defeated in battle turns a character into a trophy. The story begins with the Subspace Army, riding the Halberd, interrupting a fight between Mario and Kirby, while Peach and Zelda watch from the stands. The mysterious Ancient Minister deploys a Subspace Bomb controlled by two R.O.B.s, and while Mario tries to intercept it, he is knocked away by Petey Piranha, who has captured both princesses. Kirby defeats Petey and rescues one princess, while Wario steals the other, and after they all leave, the bomb detonates and the arena is consumed by Subspace. Mario, Kirby, Peach, and Zelda prepare to fight off the Subspace Army. Fox attempts to fight the Halberd in his Arwing but is struck down by the larger vessel and crashes in a jungle, where he joins forces with Diddy, who has been separated from Donkey Kong earlier by Bowser. They are joined by Falco and eventually Captain Falcon and Olimar, and together they save Donkey Kong from the Subspace Army, at which point Fox and Falco leave to resume their battle with the Halberd, now assisted by their carrier ship, the Great Fox. Elsewhere, King Dedede captures Luigi and uses him as bait for Wario, stealing his transport and all his trophies (including Luigi himself) when he is distracted. Wario is then defeated by Lucas and Pokémon Trainer in retaliation for capturing Ness earlier. After Pokémon Trainer catches Charizard, he and Lucas meet up with Marth, Meta Knight and Ike, who has already joined forces against the Subspace Army. They witness the Halberd battling the Great Fox, prompting Meta Knight to scale the cliffs in an attempt to reclaim his ship. On the way up, he is joined by the Ice Climbers and on the summit he teams with Lucario after an initial duel. The Ice Climbers fall when the Halberd smashes the tethered Great Fox against the mountain, but Meta Knight and Lucario take the opportunity to board the ship. Mario, Yoshi, Kirby, Link, and Pit escape from a Subspace Bomb. Meanwhile, Pit finds and revives Mario, while Link and Yoshi join forces against the Subspace Army. When Kirby wanders off, the second princess is captured by Bowser, who makes a clone of her. If the clone is of Peach, it attacks and is defeated by Link, which is witnessed by Mario, who retaliates; if the clone is of Zelda, it is defeated by Mario and Link attacks him instead. Either way, the combatants realize the misunderstanding when Dedede drives by with the other princess statue, spurring them to team up against their common enemy. They tail him back to his castle but are unable to stop Bowser from crashing in and taking the princess, leaving behind a badge that King Dedede had put on his three stolen statues. The heroes then meet up with the Ice Climbers, Lucas, Pokémon Trainer, Marth and Ike. The Ancient Minister reflects on his actions. While all that is happening, Zero Suit Samus infiltrates the Subspace Army's base on the floating Isle of the Ancients, rescues Pikachu, recovers her Power Suit and battles Ridley. She and Pikachu make their way to the Subspace Bomb depot at the same time as Diddy, Donkey Kong, Captain Falcon and Olimar, who has ridden an enemy barge to the island. They are confronted by the Ancient Minister, but after sacrificing so many R.O.B.s to detonate numerous Subspace Bombs by that point, he is unwilling to fight the Smashers. His commander Ganondorf then takes control of the robots and they shoot the Ancient Minister, burning away his clothes to reveal that he is also an R.O.B. The controlled robots all activate bombs, and unable to stop them, the heroes flee on the Falcon Flyer. Back on the Halberd, Meta Knight and Lucario team up with Snake, free the captured princesses and kick a crew of Mr. Game & Watch clones out of the cockpit. Peach and Zelda (in her Sheik disguise) make their way onto the deck as Fox and Falco attack in their Arwings, and when the exchange of shots nearly hurts Peach, Sheik retaliates and forces Fox to eject from his Arwing. Peach diffuses the tense situation by offering both Sheik and Fox tea, however, and along with Snake, Lucario and Falco, the trio defeat the Duon robot that forms from the Mr. Game & Watch clones, freeing the real Mr. Game & Watch. Meta Knight then takes the helm and flies the Halberd to shore at the same time as the Falcon Flyer lands, uniting the three groups of combatants. Bowser and Ganondorf attack the heroes before going into Subspace. Ganondorf and Bowser use the massive sphere of Subspace that had engulfed the Isle of the Ancients to bring a giant gunship into the World of Trophies and use it to fire larger Subspace blasts. The Halberd attacks and is destroyed, but this was cover to allow a group of the Smashers' smaller ships to get in close and infiltrate Subspace. Kirby also destroys the gunship with the Dragoon. The villains retreat, but Ganondorf betrays Bowser, transforming him into a trophy as he alone visits Master Hand, only to find he has been under the control of Tabuu all along. Tabuu immediately defeats Master Hand and transforms Ganondorf and all the protagonists into trophies. King Dedede's badges, however, revive Ness, Luigi and Kirby, who has eaten the dropped one, and they rescue everyone else, both allies and former enemies. Banded together against Tabuu, the group head through The Great Maze, defeating all the bosses and dark versions of themselves. Once they reach Tabuu, Sonic arrives and destroys his wings, preventing him from transforming the group back into trophies again, and together, the Smashers defeat Tabuu and restore the World of Trophies. Petey Piranha Petey Piranha captures Peach and Zelda within cages as the Subspace Army assaults the Arena, and the player has to fight him as Kirby, being able to rescue only one of the princesses. Petey actually uses the cages to attack the player. When one of the cages is attacked, its life decreases. When Petey is attacked, the HP for both of the cages' decrease. The princess within the cage to lose all of its health and break first is the one the player ends up saving. After this is accomplished, Petey is defeated and burns to the ground. In his second battle, Petey's cages are empty and the player must break at least one cage to defeat him. Rayquaza After Fox's Arwing crashes into the Jungle, Rayquaza emerges from a nearby lake and destroys what is left of the ship. Having watched this take place, Diddy Kong is captured by Rayquaza. Fox is ejected from the Arwing at the last second and rescues Diddy. A battle with Rayquaza commences. Rayquaza uses attacks such as Hyper Beam during the battle, often flying on and off the screen during its mad rushes, and falls to the ground in defeat after it has lost all of its health. Porky Statue The Pig King Statue is a gigantic statue from MOTHER 3. It has been described as virtually impossible to hit. Lucas must run from him, dodging his blows, as they can result in one-hit KO's. After running for a certain amount of time, Ness appears, and saves Lucas, only to end up encountering Porky in the Spider Mech. Porky Ness and Lucas fight Porky in his Spider Mech from Mother 3 after Ness defeats a large statue of Porky. During the battle, Porky Minch uses the machine's robotic legs to attack either Lucas or Ness. Other, more powerful attacks he uses include a very accurate laser beam and a wave of his mechanical robots (based on himself). The machine flips upside-down and squirms after Porky's life bar has been completely depleted. Galleom A large Subspace Army mech, Galleom is fought in two phases. During the first phase, he is fought by Marth, Ike, and Meta Knight. After he is defeated, he falls down into the ruins, crashing through the floor to confront Lucas and the Pokémon Trainer. After being defeated, Galleom activates the Subspace Bomb within its head and attempts to take them with it; however, the two are rescued just in time by Meta Knight after Lucas uses PK Thunder to free themselves and fall. Ridley Samus's nemesis from the Metroid series appears as a boss. Like Rayquaza, Ridley often flies on and off the screen during the battle. He has several attacks, including one in which he scrapes his tail against the ground. Many of his other attacks are similar to Master Hand's. After the player depletes his life bar as either Samus or Pikachu, Ridley falls off the platform. Duon The second of the two Subspace Army mechs. After the Mr. Game & Watches are tossed out of the control room of the Battleship Halberd, they are converted into Shadow Bugs. These Shadow Bugs combine to form Duon, fought as Fox, Peach, Zelda, Lucario, Solid Snake, and Falco. When it is defeated, it reforms into Mr. Game & Watch, who joins the effort to defeat the Subspace Army. Meta Ridley Ridley makes a return appearance in his cybernetically enhanced form from Metroid Prime, this time challenging Samus, Pikachu, Captain Falcon, Captain Olimar, R.O.B., Diddy Kong, and Donkey Kong. He chases after the group as they escape the floating island in Captain Falcon's ship. His attacks include fireballs, rushing at the player, and influencing the ship in various ways, such as forcing it downward and making it rock back and forth. Tabuu Tabuu is the true villain of The Subspace Emissary. He was controlling Master Hand and was the one turning all fighters into trophies, but thanks to a time artifact made by King Dedede, some survive. Tabuu is then weakened by Sonic and destroyed by everyone. The loading screen before each level of Classic mode, with Link acting as the first opponent. The player has to fight three random characters. The player has to fight Master Hand. If it is completed on Hard or higher, within nine minutes, and with no continues, Crazy Hand will appear too. Master Hand The final boss of Classic mode, the right hand, Master Hand is sometimes referred to as the "manifestation of creative spirit" in the Smash Bros. universe. Master Hand's existence is still a shadowed one, therefore little is known of it. Crazy Hand While Master Hand is the "manifestation of creative spirit", the left hand: Crazy Hand, is the "manifestation of destructive spirit". In Classic mode, Crazy Hand appears only if the player has arrived at the final stage with the difficulty at Hard or above with no continues, and the player must arrive at the final stage in nine minutes or less. However, if the player loses against the two hands when fighting them, Crazy Hand will not appear to assist Master Hand. Sometimes both Hands will appear at one time. All-Star mode returns from Melee, while basically the same it has had some slight modifications. It can now be played with two players and opponents are now sorted by Series rather than in a random order. No more than two foes appear at the time. The Pokémon Level has the most enemies as Pokémon Trainer uses each Pokémon separately. It is unlocked by unlocking all the characters. Beating rewards the player with a a trophy of the current character performing their Final Smash. Also, if All-Star is beaten with Co-op mode, Final Smash Trophies of both characters are rewarded. The order of the fights are also the order the games came out. Also, in Co-Op mode, the players must fight two Olimars in the last level. Wario I came to find the Mario Bros.' roots. What's this giant stage? (KO Mario and Luigi.) Mario Bros. This mode requires two human players, and has different events from the single-player mode (excluding one which was also an event in Single-Player Mode). Yoshi and King Dedede Only ten seconds left?! Beat as many foes as you can in Super Sudden Death and live! (Survive 10 seconds at 300% damage.) WarioWare, Inc. The Stadium offers several mini-games, as previously in Super Smash Bros. Melee and one new mode. The Home-Run Contest returns with quite a few differences. A shield surrounds the platform, preventing players from accidentally pushing Sandbag off the platform. However, the shield shatters if it is knocked around by the Sandbag too much. The shield disappears when the ten seconds are up. Two players can work together in cooperative play, with the two having to work together in order to set a good record. Two players can also challenge each other in two player alternating play, which features two characters taking turns to see who can punch Sandbag the farthest. Both of these modes can be played in Wi-Fi Connection mode, under the With Friends mode. Also available in the Stadium mode is Target Smash! !, a slightly altered mode of the Target Test from the previous games. There are five different levels that all characters can play on, and the replays can be sent to other players via the Wi-Fi Connection. It is also possible to play Target Smash!! with two players simultaneously. The Selection Screen for Multi-Man Brawl. Another returning feature is the Multi-Man Brawl, known as Multi-Man Melee in the previous game. In this mode, players fight the enormous Fighting Alloy Team. Objectives include defeating a certain number of Alloys, fighting them off for a set period of time, or fighting endlessly for a high score. 10 Man, 100 Man, 3 Minute, 15 minute, Endless and Cruel Settings all return. Various rewards from the challenges section are obtained in this mode. New additions to the mode include its inclusion in two-player mode, whereas in Melee the mode was strictly single player. The Fighting Wire Frames have been replaced by the Alloys. While there were only two types of Wire Frames, there are four types of Alloys. All alloys resemble and act like a certain character. Red Alloys act like Captain Falcon, Blue Alloys act like Zelda, Yellow Alloys act like Mario, and Green Alloys act like Kirby. 10-Man Brawl - KO 10 enemies. 100-Man Brawl - KO 100 enemies. 3-Minute Brawl - Fight for 3 minutes. 15-Minute Brawl - Fight for 15 minutes. Endless Brawl - Fight until the player gets KO'd. Cruel Brawl - Fight until the player gets KO'd. Additionally in Cruel Brawl the Fighting Alloys are stronger, and are capable of making one hit KOs, while no items appear. This mode is similar to All-star mode, except the player must fight all of the bosses that appear in the game. The player is provided only with three Heart Containers that heal all damage, and they only have one life. Unlike All-star, however, enemies are in random order (except for the final boss, Tabuu), and there is no option to continue after being defeated; players are instead taken directly back to the Character Select Screen. If the mode is cleared, the time taken is recorded for the high score. If not, the number of bosses defeated will be. Players can set the difficultly level to the same ones as other modes: Easy, Normal, Hard, Very Hard, or Intense. The difficulty levels will affect how fast the bosses will move, along with how much damage their attacks will inflict. It is unlocked by clearing Subspace Emissary for the first time, and by defeating Classic Mode at least once. Crazy Hand does not have to be fought to unlock the game mode. Also, like All-Star mode, Boss Battle Mode can be played with two players simultaneously. If done so, there will be six Heart Containers total instead of three at the healing area. The Training mode returns from Super Smash Bros. Melee. It allows the player to learn to play the game properly, or to experiment with certain functions and items. The player fights one to three characters, which can be controlled by the CPU, the player, or not move at all. The player can create any item to test it, as well as the Smash Ball to practice Final Smashes. The hit damage of the CPU can be predefined, and the game can be put in slow or quick motion. Choosing alternate characters for the start of a match. Four characters (Donkey Kong, Pit, Falco, Snake) begin their battle in Skyworld. Very similar to previous games, in which 2-4 players or computers may battle. The players can select their characters, who also have alternate costumes, and choose the stage to play on. As the battle begins, while the announcer is counting down, each character appears with their specific entrance. For example, Samus comes out of a teleporter and Mario out of a Warp Pipe. These entrances were present in the original Super Smash Bros., but not in Super Smash Bros. Melee, for unknown reasons. As in the last two games, Super Smash Bros. Brawl has Handicaps to help beginners in battles. However, this time, handicaps do not affect the player's attack strength and knockback resistance, but instead, changes a player's starting damage percentage. The handicap can be from 0% to 300%. For example, one player can start at 0% damage, but the other starts at 50%, even after that player has been knocked out. This allows players to test their skills, or just to give them a challenge, as well as helping beginners learn the basics. For characters with multiple forms, the character selection screen allows the player to choose which character they will start with, by clicking the alternate form (i.e. Sheik). This means characters like Zelda can be used to select Sheik. Depending on the choice, that will be the character the player starts as in the beginning of the match. Time: In these matches, fighters will score a point for each KO and lose a point for each fall or self-destruct. The fighter with the most points when time runs out wins the match. If there is a tie, the match will go into Sudden Death. In this situation, there is no time limit but each fighter has only a single life and starts with 300% damage. The last one standing wins. Stock: Each fighter has a set number of lives. They lose one each time they fall off the stage. When a fighter loses their last life, they obviously do not reappear. The last fighter standing wins. Coin: Fighters collect Smash Coins to increase their score, which is displayed above their damage gauge. Bronze coins are worth one point, silver coins are worth three points, and gold coins are worth six. There are also bills, which adds ten points to their total. Coins are created when a fighter receives damage. The value of the coins corresponds to the strength of the attack. However, these coins are not subtracted from the victim's score. Fighters have unlimited lives, but their score is cut in half when they fall off the stage (100 if they have 200 coins or more). Whoever has the highest score when time runs out wins the match but if there is a tie, a Sudden Death match will occur. Players can also set handicap and damage ratio. With handicap, fighters can start matches and respawn with automatic damage. Damage ratio adjusts the total knockback. It can be set from 0.5 to 2.0 at intervals of 0.1. By default, it is set at 1.0. The higher the number, the higher the knockback. Players can also determine what chooses stages. They can freely choose the stage, for instance, or have the loser of the match pick the stage. Players also have the ability to determine which items appear and how often. These additional rules can be unlocked by players score 200 KOs in Group mode. Players can set time limit for a stock match, turn on team attack, turn off pausing, enable score display, or hide percentages. When all stages are unlocked, players can adjust which stage is allowed to be selected at random. A new feature is the Special Brawl. Using this, players are able to customize the battle themselves. This means they can attach items, set stats, and add appearance differences to all the players, right from the start of the battle, without having to collect the items themselves. 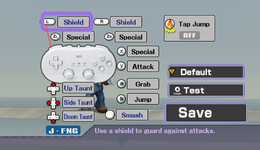 The Special Brawl, thus, allows players to try a variety of settings such as Invisible Bunny Brawl, instead of the settings given on a certain type of battle, as seen in previous with the Special Melee modes in Super Smash Bros. Melee. Records involving Special Brawl are not saved. Also, in Stamina Mode, unlike in Super Smash Bros. Melee, players can choose how much HP they'll start with; from 1 HP, all the way up to 300 HP. The Rotation mode is an enhanced version of the Winner Out/Loser Out Tournament modes of Super Smash Bros. Melee. It allows more than four players to play at the same system, by passing the controllers on after each battle. Up to sixteen players can be put into the queue, with each given the possibility to use their name and their personal controller configuration. However, this is not required. There is still the option between Winner Out and Loser Out, where the winner or the loser of the match pass the controller on to the next player after the match, respectively. Additionally, players have the option to pause, i. e. moving themselves at the end of the queue. The mode is available when two or more controllers are connected to the Wii. Players can change their character in the middle of the Rotation Mode, like in Super Smash Bros. Melee. The Tourney Mode from Super Smash Bros. Melee (then "Tournament Mode") is in Super Smash Bros. Brawl, acting the exact same way as it did in Super Smash Bros. Melee. Players are able to brawl in a tourney, that can have up to thirty-two players, and must fight their way to the championship, eventually earning a cup if they win. It is possible to play with friends, or battle CPU characters. Apart from decreasing the total number of players from sixty-four to thirty-two and letting players put in more characters on stage than controllers (such as four characters when there are only two controllers connected), nothing has changed compared to Super Smash Bros. Melee. Nintendo Wi-Fi Connection is a new feature in Super Smash Bros. Brawl. However, similar to what happened with Mario Strikers Charged, the game tends to slow down and fail when the players are playing far away. The further away the players are from each other, the more the problem worsens. So, playing a game from Japan to America will slow the game down, and cause some problems in the battle. Regardless, the game is still capable of connecting overseas. The two modes are With Friends and With Anyone. When playing with friends, players use friend codes in order to brawl with each other. They choose an emblem to represent themselves. Emblems can be the games' series emblems, the characters' icons, or Miis. In this mode, players are able to send messages to each other in-game, using the Taunt command. Players can send four different kinds of messages, one for each direction: up, down, left, and right. Results are recorded only in this mode. The Home-run Contest and Multi-Man Brawl are also playable in this mode. 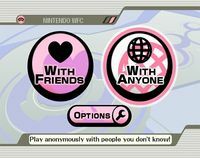 The With Friends mode selection screen. When brawling in the With Anyone setting, players are unable to send messages to each other in-game, and neither can they see the name or details of their opponent. Also, the results of the battle are not recorded in the With Anyone mode. There are several modes in the With Anyone setting. In the Basic Brawl, players play against each other without teams. However, the rules are set to 2-Minute Brawl and cannot be changed. However, players can individually change their item settings. The game will randomly use the item setting of one of the combatants. If there are less than four players, there will be CPU enemies present to make there be four characters. When a player disconnects from the Wi-Fi connection while battling, a CPU takes over their character. Unlockable characters are also available in this setting for a player who has unlocked them. Because of this, Nintendo recommends players not to use the Basic Brawl setting if one is not wanting to get the unlockable characters spoiled. A different mode in the With Anyone setting is the Team Brawl. While the game is loading, or while the players are waiting for other opponents, they can practice the game by attacking the Sandbag from Super Smash Bros. Melee. Players can choose to be spectators of the battle, and even bet coins on who will win. Here, various content can be found, such as content that is received when players achieve certain tasks. Trophies return in Super Smash Bros. Brawl. They act the same way, some being collected the same way, but there are now new trophies, and they are more easily stored, as an image of the trophy will be seen when players select a trophy. 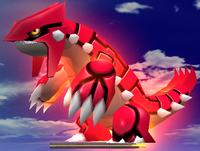 They can also be displayed the same way they were in Super Smash Bros. Melee. When a trophy is selected, a description of the character or object portrayed will be displayed. There are a total of 544 different trophies to collect. In the Subspace Emissary if the finds a Trophy Stand and throws it at an enemy it turns it into a trophy. Many trophies can be placed as a part of dioramas. There are also more backgrounds that can add to this new feature. Throughout the game, players can find Stickers, which show up at random points during Brawls. Unlike trophies, however, the items will be much easier to find and are simply pieces of 2D game artwork rather than 3D models. Stickers are stored in an album. They can be used to power up characters in the Subspace Emissary. Stickers however have one use and once used, the player cannot acquire them back unless they happen to collect the same kind of sticker again. Similar to the Trophy Hoard, stickers can be used to decorate a screen. Different backgrounds can be selected, and pictures can be taken. Screen shot of the Coin Launcher in use. The Coin Launcher is a mini-game available in the Vault, replacing the Lottery mode from Super Smash Bros. Melee. 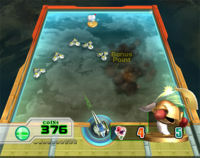 In this game, the player uses the coins which they have won in the Classic Mode, the Subspace Emissary, the Group mode or by betting on the winner in the Wi-Fi connection's Spectator Mode, to get trophies and stickers. The player controls the Coin Launcher, a cannon that shoots the coins the player has collected. Several moving objects appear at regular intervals, of which there are a few different types. Each different type moves in a different formation and direction across the screen. If the player shoots all the enemies in a particular group formation, the player will often gain a sticker as a reward. However, the main aim of this game is to hit the Trophies to win them. These appear quite regularly, and move across the screen in a random path, although these are predetermined. A trophy must be hit with two to four coins to be collected. There are some hazards in this game; mainly the missiles which appear and aim for the Coin Launcher. Each one takes two hits to destroy, but some move much faster than others, and occasionally a large group will appear all at once. If a missile hits the Coin Launcher, the player loses ten coins, and a special green gauge decreases. This gauge, located on the bottom left corner of the screen, if filled up completely, allows the player to rapid-fire coins for a short time when it is filled. It is filled slightly whenever a missile is destroyed, or a certain number of moving objects. The Stage Builder in action. Mario and Luigi battle on a stage, made by the Stage Builder. Players create custom stages using this mode. When making the stage, players first pick the size of the stage, and then creating a background pattern, as well as the music from the game that will play on the stage. Once done, the player can start adding pieces to the stage, whether it be simple platforms to ladders to spikes. However, each of the four control types have different ways to move the pieces, however, they are all able to flip, resize, zoom, swap palettes and erase pieces of the stage. After building a fraction of the stage, it can be tested out before being saved. This can be done several times, if it is necessary. After the stage is finished, the name and comment can be chosen, as well as an option to change the music of the stage. It can be sent to other players via Wi-Fi Connection, but cannot ever be played on using the Wi-Fi connection. At one point, it could have been sent directly to Nintendo using the "Submit" option on the Stage Builder screen. Every day, Nintendo would send a selected stage to every player with Wi-Fi and Super Smash Bros. Brawl, so they could try out the stages that other people have made. The stage was removed after a day had passed, and a new one was brought in the next day. This allowed players to make and try out new stages for themselves every day. However, this ability to send vault data to Nintendo was discontinued. All three kinds of collectibles in Super Smash Bros. Brawl - trophies, stickers and CDs - can be alternatively won in the Challenges mode. Stages, Masterpieces, and Stage Builder parts can also be unlocked. The Challenge mode has many closed windows which contain the prizes. 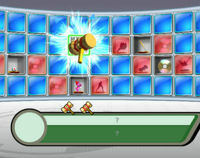 When the player unlocks an item by winning a challenge, for example playing the Target Smash level 1 with 10 different characters for the Stafy trophy, the collectibles left and right to Stafy's trophy, which are currently not won and invisible, appear in a red silhouette, and their method of unlocking is displayed. The player can also win Golden Hammers, which they can use to automatically get any window of their choice open, getting the item inside. However, not all windows can be destroyed with a hammer; objectives related to the Boss Battles mode cannot be opened. There are a total of 128 objectives in the Challenges Mode. Throughout the game, the player is able to take screenshots while pausing the game. In contrast to Super Smash Bros. Melee, there is no special camera mode needed. The screenshots can be either saved on the Wii's internal memory or an SD card. A new feature in Super Smash Bros. Brawl is Replays. This can be used on a single Brawl in Group Mode, Target Smash! !, Home-Run Contest, and Multi-Man Brawl. They can be recorded by pressing Z after the brawl or the challenge has ended. The maximum time for a replay to be recorded is three minutes. They can later be accessed and replayed from the Vault, or be sent to an SD Card. Players could also submit Target Smash!! and Home-Run Contest records to Nintendo, via WiiConnect24. However, the service was discontinued after June 30th, 2009. All titles have a restricted time they can be played in. However, some, like Super Metroid, come with save data. Here, the player can view a list of many video game titles that have been released by Nintendo and when they were released. The titles are sorted and separated by which system they were for (e.g. Game & Watch, Game Boy Advance, Wii). More titles are added as trophies and Stickers from those games are collected. Players can toggle with various settings and features. For instance, they can adjust the aspect ratio of their screen, or set the graphics appearance. They can also adjust the rumble feature and set control schemes to save on names. They can also adjust the music and sound effect volume while having quick access to the Sound Test. Finally, players can erase certain records of their data or erase everything. My Music for Delfino Plaza. Rather than restricting each stage to one music track, as in the previous games stages have a selection of music tracks usually from the game series the stage is from, and players can choose which music track they want to play on the stage using the My Music mode. For example, on the Delfino Plaza stage (image shown on the right), players can choose between the Delfino Plaza theme from Super Mario Sunshine, the title/ending theme of Super Mario World, the main theme to New Super Mario Bros., and many more. Players can set how commonly the track may appear on the stage. To add more music to the collection, the player must collect CDs, which randomly appear across the entire game, in many of the numerous modes of play. They can also be earned by completing challenges and certain game modes. After all music tracks have been collected, the CD will appear no more. A variety of content is stored here including records from group matches. This section of Gameplay records has 4 different pages. The first page is a chart showing the total number of KO's each fighter has performed on each fighter. The second page shows the top 5 fighters for each of sevaral stats, such as KO's, falls, self-destructs, victories, losses, peak damage, walking distance, swim time, drownings, etc. The third page lists all the same stats for each individual character. The fourth and final page similarly lists all the same stats for each name; as well as the fighter used most, second-most, and least. Players can view also various gameplay records of gameplay; including, but not limited to total time playing this game, matches played, total damage, trophy count, and fighter most used. Notices, special messages that congratulate the player and appear when certain accomplishments are done, such as unlocking important things and clearing game modes for the first time, are saved in the order that they appeared. When cutscenes are viewed in The Subspace Emissary, they can viewed again. There are also five pre-installed videos: a How to Play video, the E3 trailer, another introductory video, and videos that each focus on a new third-party character. Songs and sound effects in the game also can be listened to here. Some songs need to be unlocked by completing challenges or picking up CD's. The game that each song originated from is displayed when the song is selected. Group artwork used on the box art. Masahiro Sakurai, the creator of the Kirby and the Super Smash Bros. series, is heavily involved during this production, being the director. Masahiro Sakurai is also a former member of the HAL Laboratory game company, and he is now part of the Sora company. The game also uses the Havok game engine, a trait shared by various other non-Nintendo games, making it the first Super Smash Bros. game and the only Nintendo game to do so. 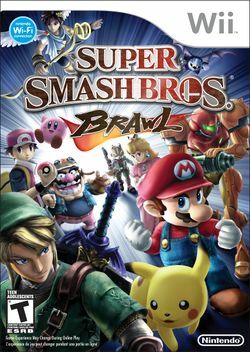 Other companies have been involved in Super Smash Bros. Brawl's development, especially for its extensive soundtrack, including Camelot Co., Ltd., Namco Bandai Games Inc., and Monolith Software Inc.
Meta Knight's damaged mask after prolonged damage. Captain Falcon's broken visor after prolonged damage. Early in development, a damage system would have been implemented that would cause characters to shown signs of visible damage and strain during prolonged battles. Among those found included Meta Knight's mask that would develop large cracks, or Captain Falcon's helmet whose visor would crack to reveal a part of his face. First, the player must select the Bridge of Eldin stage. The player should also have a Final Smash prepared. King Bulbin will eventually come and destroy part of the bridge with a bomb. Soon after, a portal will restore that part of the bridge. When the matter begins to rebuild the bridge, the player has to use the Final Smash in midair in the gap. Jigglypuff will begin to inflate while the bridge is getting mended. When the bridge is completely fixed, Jigglypuff should bounce up onto the bridge and remain giant. Its attacks are completely the same, only that they have a much longer reach. Its movement seems to have slowed somewhat as well. It also becomes a very easy target and is simple to KO, as the slightest touch of the KO range will take it out. With this glitch activated, having Yoshi perform his Egg Lay attack will make Jigglypuff grow even bigger. First, the player must choose Zelda/Shiek. The other player must use a lightning bolt to make you either shrink or grow. Once the player has changed size, they must use their Down+B special move to transform to Shiek/Zelda. The player can transform back to who they were before; this is optional. By doing this very simple glitch, Zelda/Shiek will stay at their size forever. However this glitch will only keep working until Zelda/Shiek is affected by another size-changing item. This glitch will work with any mode, any color, any size (Mini or Mega Brawl) and any rule. As long as items are turned on and lightning bolts are able to spawn. For a complete list of media for this subject, see List of Super Smash Bros. Brawl media. Underground Theme - Super Mario Bros.
Donkey Kong: 75m appears as a stage, where Donkey Kong in his original sprite form appears as a major stage hazard; 25m's theme appears as a song in this stage. Mario's red-and-blue costume also originates from this game. Donkey Kong Jr.: When Diddy Kong, Fox, and Falco arrive at the barge taking the recently-trophified Donkey Kong to the Ancient Island, Donkey Kong's trophy is shown in chains on the arms and legs, referring to Donkey Kong's (or, technically, Cranky Kong's) captive status in the game, particularly the final level of the game. Mario Bros.: A stage based off this game appears, complete with the POW Block in the center and obstacles such as Shellcreepers and Sidesteppers. The Mario Bros. title theme is arranged for this stage. Wrecking Crew: The Golden Hammer appears as an item. Super Mario Bros.: Mushroomy Kingdom appears as a stage, taking the forms of World 1-1 and World 1-2 from said game. The ground, underground, and underwater themes from this game are rearranged. Super Mario Bros. 3: The Airship theme from this game is rearranged; additionally, the middle portion of "Castle / Boss Fortress (Super Mario World / SMB 3)" is an arrangement of the boss battle theme. Ludwig's artwork from this game appears as a sticker. Super Mario Land: An arrangement of this game's dungeon theme appears as a song in the World 1-2 portion of Mushroomy Kingdom. Super Mario World: On the Delfino Plaza stage, a medley of the title and ending themes from this game appears as a song. The beginning and ending portion of "Castle / Boss Fortress (Super Mario World / SMB 3)" are an arrangement of the Castle theme from this game. Mario Kart series: A stage based off of Figure-8 Circuit from Mario Kart DS appears, while several music pieces across the Mario Kart games are rearranged. Shy Guys appear as racers / stage hazards, with a lone one previously appearing as a playable racer in Mario Kart DS. Wario Land: Super Mario Land 3: The Dash Attack appears as Wario's forward smash, while his down throw somewhat resembles his Ground Pound. Donkey Kong Country series: Songs from the first two games have been rearranged or directly ported in Super Smash Bros. Brawl. Diddy Kong's moveset is inspired from these games, including his signature cartwheel which appears as his dash attack. Super Mario 64: The main theme from this game is directly ported, and appears as a song on Delfino Plaza. Donkey Kong 64: The Peanut Popgun and Rocket Barrel appear as Diddy Kong's standard and up specials; both moves are combined for Diddy's Final Smash, Rocketbarrel Barrage. Luigi's Mansion: Luigi's Mansion appears as a stage. An arrangement of the main theme for the game plays as one of the songs on said stage. Super Mario Sunshine: Delfino Plaza appears as a stage, with songs directly ported from Super Mario Sunshine. F.L.U.D.D. appears as Mario's new down special. WarioWare series: A stage based off the WarioWare games appears, featuring snippets of various microgames. Several songs from the WarioWare games are featured, including Ashley's Song and Mona Pizza's Song. Additionally, the Wario Bike is featured as Wario's side special, while Wario-Man appears as his Final Smash. Wario World: The Wild Swing Ding appears as Wario's forward throw. Donkey Kong Jungle Beat: Rumble Falls appears as a stage. The song "Battle for Storm Hill" is directly ported from this game. Mario & Luigi: Partners in Time: An arrangement of Gritzy Desert's theme is featured as a song in Mushroomy Kingdom. New Super Mario Bros.: An arrangement of the game's ground theme appears as a song in Delfino Plaza. Super Mario 3D World: One of the Mystery Houses is known as Mystery House Brawl, which is found in World Mushroom. Super Smash Bros. for Nintendo 3DS / Wii U: A handful of enemies originating from the Subspace Emissary return in the former game's Smash Run mode, while many arrangements of Super Smash Bros. Brawl's theme song reappear in both games. Super Smash Bros. Ultimate: When Petey Piranha appears in Piranha Plant's Final Smash in this game, he uses his appearance from Super Smash Bros. Brawl and holds cages. A Primid, Shadow Bug, the Ancient Minister, the Fighting Alloy Team, Duon, and Tabuu also make appearances as spirits, while Galleom reprises his role as a boss in the World of Light Adventure Mode. Wii Aaron Linde, Destructoid 9.5/10 "In Brawl, Nintendo has handily produced one of the most compelling, rich and densely-packed experiences available on any console. A must-buy for Wii owners and a compelling lure for those who have yet to adopt the system, Super Smash Bros. Brawl is one of Nintendo's finest efforts yet." Wii James Temperton, Cubed3 9/10 "We not going to score it a perfect ten as we managed to spend a good few paragraphs nit picking out things we don't like, that's not to say this game isn't totally brilliant. Its a bit like a total snob going to a really good restaurant and complaining that the sauce drizzled delicately over the perfectly cooked pork joint is just a bit too tangy and making a scene about it. We're the snobs, Brawl is the pork and oh so very slightly erroneous sauce. What's great about this game is the way in which anyone can enjoy it. Single player, multiplayer, online multiplayer, sitting-around-looking-at-trophies player, this game has it all. Epic, beautiful and quite wonderfully Nintendo in its almost sexual brilliance. Arousing stuff." Wii Tom Bramwell, Eurogamer 9/10 "However, control and structural quirks will struggle to compromise your long-term entertainment - and Brawl really does offer that. It's consistently satisfying over long periods, fulfilling its usual role of dominating a willing crowd's evening into the early hours, and now allowing you to sustain that after everyone's gone home using the Internet. Really the only reason you wouldn't feel that way would be if you didn't stick with it past the dizzying first quarter of an hour, or if you don't like Nintendo characters - and if you don't in either case then you probably aren't reading this anyway, and the prospect of Triforce-smashing your friends to death won't mean anything. Otherwise, persist, and enrich yourself, and wonder where on earth it all goes next." 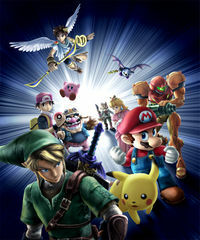 For this subject's image gallery, see Gallery:Super Smash Bros. Brawl. 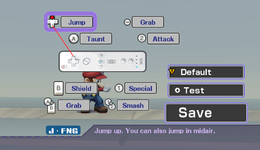 If the player is using a Nintendo GameCube controller or a Classic Controller, tilting or while on the main menu will change the camera angle. This is the first and so far the only Super Smash Bros. installment to not feature stages from the original Super Smash Bros. This is one of the few Mario games given a T rating by the ESRB, the others being Donkey Konga 2 and Super Smash Bros. Melee. ↑ Press Release on the Error Message on the Japanese Official Nintendo Website (in Japanese), published 2008-2-1. ↑ Super Smash Bros. Brawl: Havok engine confirmed - GoNintendo, published 1/28/2008. ↑ Press Release on the Release Date on the Japanese Official Nintendo Website (Japanese), published 1/15/2008. ↑ Smash Bros. DOJO!! - American English Edition, published 1/15/2008. ↑ When finishing it as Zelda or Sheik the player can only get the trophy of her current form, unlike in Melee where they received both. The same applies to Samus and Zero Suit Samus. Classic must be cleared three times with the Pokémon Trainer to obtain all the trophies, clearing it only rewards the player with the trophies of the Trainer and the Pokémon in use when it was cleared. ↑ Finishing it as Zelda or Sheik does not give the player the other's trophy, it must be cleared twice. The same applies to Samus and Zero Suit Samus. All-Star only needs to be cleared once for Pokémon Trainer, unlike Classic. ↑ 10.0 10.1 "Masterpieces" on the Smash Bros. DOJO!! - Japanese Edition, accessed 2008-1-25. This page was last edited on April 17, 2019, at 12:16.